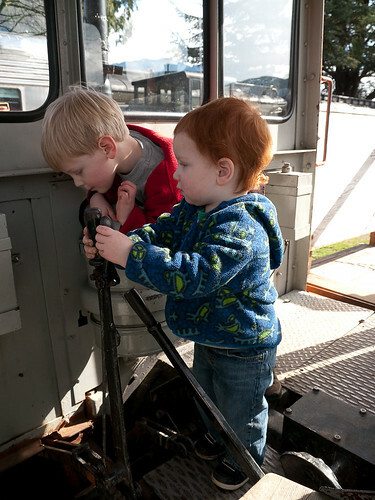 The second part of our adventure to Snoqualmie Falls was a trip to the Northwest Railway Museum. It was my first time there, and the trip was a bit of a whim. Let me get the good news out of the way first: The railway museum is free, and it’s authentic. There’s a Victorian train depot and lots of old rail cars from the 1940s and 1950s. The site is clean and well-maintained. The bad news: In spite of being about trains, it’s not a terribly kid-friendly musuem. There’s a gift shop, and lots of rail cars to see from the outside, but only one locomotive you can walk in and nothing in the way of hands-on exhibits. There were some well-done placards by the old rail cars, but with two kids in tow I didn’t have much time to stand around and read. So, not the best place for an almost-two and almost-four-year old. 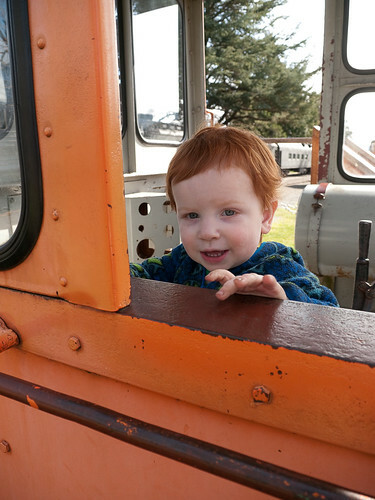 But the sun was shining, there was one small orange locomotive that the kids could get in… and it was free!